Anemia is not a disease, it’s a good news. However, anemia can be an indication of some serious illnesses and that’s a very bad news. So, you need to check first with your doctor and ensure that you don’t have hemolytic anemia, sickle cell anemia or sideroblastic anemia. These types of anemia occur due to malfunctioning of your body which can be treated through proper medical intervention only. If everything is all right but you are still diagnosed with anemia, it is due to nutritional deficiency. You suffer from deficiency of iron, vitamin B 12 or folic acid. You should understand that your red blood cells count has gone really low and they can’t now carry enough oxygen to your body parts. Your hemoglobin, which carries oxygen to your various body parts, may also have reduced to such levels that may pose risk to your health. Therefore, you need to supply essential nutrients to your body so as to treat this nutritional deficiency anemia. Here are some home remedies for anemia of such type. Apple is rich in iron along with many other health friendly components. On the other hand, beet is high on folic acid as well as fiber and potassium. Its most nutrient-rich part is just under its peel. So, if you plan to have beets, you may cook it in a microwave oven or just roast it on gas stove with its peel still on it. After it gets cooked, peel the beet and have it. While you can always have an apple or two in a day, when you mix with beet with apple, your chances of fighting off anemia doubles up. Mix apple juice with beetroot juice. Add honey to this and stir well to mix it in the juice. Have this juice twice a day. Sesame seeds are yet another ingredient that may excellently work to treat anemia. Especially the black sesame seeds are a rich source of iron. There is more than one way to have sesame seeds for anemia. Then strain and crush the seeds to get a paste. Add honey to this sesame seeds paste and mix well. Have this honey-sesame paste twice a day. Soak sesame seeds in warm water for 2 hours. Grind it to get a paste. Strain to get its emulsion. Mix it with a cup of milk. Add honey or jaggery and mix well. Have this sesame flavored milk daily. This is the folk remedy to fight with anemia. Blackstrap molasses not only contain high levels of iron but also folate which is a natural source of folic acid. There are many B vitamins too in molasses. With all these components, molasses can increase red blood cell production efficiently. What is important is that even people suffering from diabetes can have this due to its low glycemic index. While you can always cover your waffles, pancakes or any other food with molasses, here is a fine home remedy to follow everyday. 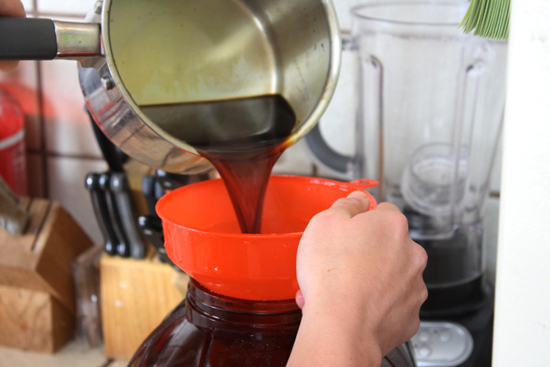 Mix molasses with apple cider vinegar. Add water to this and mix well. Just half cup of spinach daily is what you need to cure your anemia. This dark green leafy vegetable is high on Vitamins A, B9, E and C, iron, fiber, calcium and beta-carotene. Just half a cup of boiled spinach has 3.2 mg of iron which is about 20% of the daily iron requirement for a woman! So, include spinach in your daily diet. However, never forget to boil spinach, even if for a minute because spinach also has oxalic acid in it which interferes with the absorption of iron by the body. Boiling the leaves can reduce its oxalic acid levels. Include spinach in your daily plate of green vegetable salad. If you already have it, you might like to increase its quantity. Other vegetables in your salad may include celery, broccoli, kale, watercress etc. Boil half a cup of spinach in a cup of water to make a soup. Add your favorite seasoning to make it tasty. Have this soup twice a day. Add two teaspoons of honey to a glass of spinach leaves juice. Drink this juice everyday, at least for 40 days. Just having more iron is not sufficient. You should be able to absorb that iron too. For this, among other foods, you can have tomatoes for best results. Tomatoes are rich sources of Vitamin C and lycopene. Vitamin C is needed by your body to absorb iron. Eat 1-2 raw tomatoes everyday. You can include them in your salad, sandwiches etc. or just eat them separately. Drink a glass of tomato juice everyday. Add tomatoes while making your dishes. Pomegranate can be called a super fruit because it has too many beneficial components within it. It has protein, carbohydrate, fat, fiber and sugars too. More importantly, it has iron and calcium. It is enriched as well as minerals like potassium and copper other than a host of vitamins. It excellently increases hemoglobin in your blood and supports healthy blood flow. You will feel lesser exhaustion, dizziness, weakness that are typical symptoms of anemia. Have a medium-sized pomegranate (about 200 g) every morning on an empty stomach. Have a glass of pomegranate juice everyday with your breakfast. Parsley, also known as rock celery, is perhaps the most popular culinary herb used worldwide. Apart from various other beneficial components, parsley is very high on iron and folic acid. A 100 g of parsley contains 5.5 mg of iron which means half a cup of fresh parsley or 1 tablespoon of this dried herb can meet 10% of your body’s daily requirement of iron! Not only this, its vitamin C helps your body to absorb iron well. Use parsley in your sandwiches and salads. Toss some fresh or dried parsley in your soups, gravies, stews and even sauces. When preparing a juice, add some parsley, say about 1-2 tbsp with it. Make tea using parsley. Pour hot water over parsley leaves, steep for a couple of minutes, if required add a tsp of honey and have this herbal tea twice or thrice a day. Delicious palm tree fruits, dates, are a rich source of iron. Per 100 g of dates contain 0.90 mg of iron. Therefore it makes a good remedy for anemia as it helps increase hemoglobin in your blood. Dates are also rich in such minerals as calcium, manganese, copper, and magnesium. Copper particularly is required for the production of red blood cells. So have dates daily to treat your anemia. Soak 2 dry dates in a cup of milk overnight. Eat the dates in the morning on an empty stomach. Do not discard the milk, drink this as well. If you do not want to soak dates, have a handful of them on an empty stomach in the morning after which drink a cup of milk to remain energetic throughout the day. You may also soak 1-2 dates in a cup of warm water for 2-3 hours. Drink this water once it cools down. This is especially good for people who are lactose intolerant and cannot have milk or milk products. The iron that we get from animals is called heme iron. Our body absorbs this dietary iron better than the non-heme iron which we get from plant-based foods. It can absorb anywhere between 15-35% of the heme iron and that is a good number. Organ meat like liver, is a powerhouse of iron which is the most important nutrient that your body needs when suffering from anemia. Organ meats are much higher in nutrients than the muscle meats. A liver can provide you anywhere between 16 to 85 percent of your daily iron requirement depending upon what liver you are eating- calf, pork or chicken. Liver of chicken is one of the best sources of iron. The raw chicken liver has 9 mg iron while beef liver contains about 5 mg of iron. The liver is also a very good source of B vitamins, especially B12 as well as copper, phosphorus and zinc. However, it is also important to eat organ meats of those animals which are raised on fresh pastures and are not treated with hormones, antibiotics and commercial feed. So, if you eat non-vegetarian foods, you should include eating liver to increase iron content in your blood and to get rid of anemia. However, if you survive on vegetarian foods only, there are many more options like legumes which we discuss next. As you now know, your body can get two types of dietary iron- heme and nonheme- from two sources namely animals and plant-based foods. Heme iron is found in animals, particularly red meat, fish and poultry. Nonheme iron can be found in both animals as well as plant-based foods. Vegetarian sources of nonheme iron are vegetables, grains, lentils and beans. Whole grains, legumes as well as nuts are good vegetarian sources of iron and folic acid. However, you need to have balanced vegetarian diet if you intend to source your iron from plant-based foods because heme iron which you get from animals can be absorbed well by your body without depending upon other dietary factors. Absorption of nonheme iron, however, depends upon other foods too that you eat. So, take a balanced diet and also avoid certain other foods. Here are some tips for you. What to have for getting iron from a vegetarian diet? Have legumes like kidney beans, lima beans, green peas, chickpeas and pinto beans all of which are good sources of iron. Have nuts like peanuts, almonds and walnuts. Half a cup of walnuts can give you 3.75 mg of iron. Have pulses and wholegrain cereals. Have lots of fruits and vegetables as their vitamin C and organic acids keep an iron in a reduced form so that nonheme iron is absorbed better by your body. Do not have tea, coffee, and cocoa with meals as polyphenols in them inhibit the absorption of nonheme iron by the body. Raisins are an excellent source of various nutrients including calcium, potassium, sodium, protein, fiber and iron. A 100 g of these dried grapes can provide you with 1.88 mg iron. Many traditional medicines use raisins to treat anemia. You too can have them. In the morning, have them along with honey. Honey, also rich in iron, doubles up the amount of the nutrient you get. Ash gourd, also called winter melon, white gourd, winter gourd and wax gourd, has been used since ages by Chinese and Ayurvedic medicine to treat various ailments and medical conditions. Rich in minerals and vitamins like calcium, iron, phosphorus, thiamine, riboflavin, niacin and vitamin C, ash gourd is used as a sweet for curing weakness due to anemia. There are many ways to use ash gourd to treat your anemia. While Ayurveda recommends drying of ash gourd fruit and leaves to get their powder. 1 tsp of this powder should be taken daily with a glass of buttermilk to treat anemia. However, because it is a tough task to dry out the gourd completely, here is another way to use ash gourd for treating anemia. How to use ash gourd to cure anemia? You need to make a sweet preparation using ash gourd. Peel the ash gourd and remove its seeds along with the soft pulp around the seeds. Cut the gourd into 1-2 inch pieces. Using a fork, make tiny holes in the pieces. Don’t exert much pressure. When the water starts boiling, add the pieces of gourd in it. Cover and let it boil for about 5 minutes. Pieces should not get too soft. Take out the pieces of gourd. Drain out the excess water with the help of a strainer. Add sugar with gourd pieces in a vessel in which you will cook them together. Don’t cook it now. Cover the vessel and leave for 30 minutes. Don’t add water as sugar will dissolve in gourd’s own water and make syrup. After half an hour, place the vessel on a gas stove and cook it on low flame till the sugar dissolves completely. Once the sugar dissolves, make the flame medium and cook gourds in sugar syrup on this medium flame. Keep stirring. Cook till the sugar syrup takes such consistency where it will become dry once cooled. Leave the sweet in the vessel only for about 7 hours or overnight. After 7 hours or so, take out the sweetened ash gourd pieces and place them on a strainer so that extra syrup is drained and the sweet becomes dry. Have 1-2 pieces of this sweet daily to cure anemia. Due to natural sugar preservative, you can store this sweet for about a month. While this is an Ayurvedic recipe for anemia using ash gourd, you can easily find the fruit in any Chinese store too. Chinese medicine extensively uses ash gourd to treat various diseases. Anemia is caused due to nutritional deficiencies. Certain fruits and vegetables are excellent to increase the amount of iron and folic acid in our blood. We have talked about beetroot, apples, dates, raisins, ash gourds and other such veggies and fruits. Now let’s make a bottle gourd soup can also cure anemia. Add bottle gourd, beetroot and spinach to this water. Cover the pan and let it boil. Boil till the veggies become soft. Once the veggies get cooked, take out the soup. You may have the soup with pieces in it or mash the vegetable pieces. You may also discard the pulp after mashing using a sieve. Have this soup daily to cure anemia. Yellow dock is recommended by many herbalists for treating anemia due to iron deficiency. Although iron content in yellow dock root herb is not too much, what is important is its ability to increase mineral absorption by your body. This means, by itself yellow dock root cannot cure anemia but when used with other herbs rich in iron and other required nutrients, this herb can do wonders by absorbing the minerals in an excellent way. Take water in a pot. Add all the herbs into it and simmer for 30-40 minutes. Keep the pot covered while simmering the decoction as water will get reduced during the process. Add molasses to the decoction that you get. Have one cup of this herbal decoction three times a day. If you feel the decoction is too strong, you may add some water and honey too before having it. This herbal remedy also prevents recurrence of anemia. Till now you have known that you have to give full attention to your diet to fight off anemia resulting from a deficiency of iron, folic acid, B vitamins and some other nutrients. Along with a balanced diet, you can use herbs and other plant portions to treat your anemia. Wheatgerm is one of them. It is a portion of wheat kernel which is removed while processing refined flour. Wheatgerm is a powerhouse of nutrients, main being iron and zinc. Why not use wheat germ for anemia then! Here is a recipe for making a homemade iron tonic with wheat germ. This is particularly beneficial for vegetarians who cannot get some first rated nutrients sourced from animals. Add wheat germ, brewer’s yeast, molasses and canola oil to orange juice. Mix well. Although you need not you may mix it in a blender too. Have this homemade wheatgerm iron tonic 1-3 times a day. 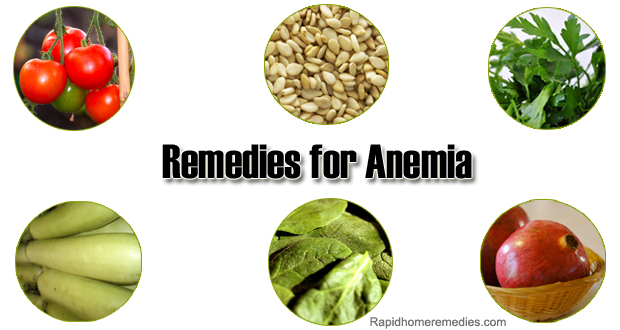 Above home remedies for anemia are great for acquiring nutrients that your body lacks. However, having well-balanced diet is essential to prevent recurrence of anemia. Iron-rich foods- like liver, figs, seafood, molasses, beets, brown rice, whole grains, poultry, eggs, grapes, raisins, yams, almonds, and beans. Potassium-rich foods- like broccoli, bananas, sunflower seeds, vegetables, whole grains, kiwi, dried fruits. Manganese-rich foods- like whole grains, legumes, nuts, pineapple, eggs. Vitamin C rich foods- like citrus fruits, tomato, green pepper, and chives. Folic acid rich foods- like fresh green leafy vegetables, mushrooms, lima beans, black-eyed peas, kidney beans. Avoid having coffee, tea, beer, or carbonated drinks like colas with meals otherwise, you’ll block the absorption of iron by your body. When you eat these foods, you may not require to follow home remedies for anemia any more! Never knew some of these ! Do not take Dong Quai Root if pregnant. Thanks for info.my mom in this condition n now m try to ask her to change her diet. This information is very helpful for my family, thank you. in olden days how they treated anemia specify home remedies? My Mom has been drinking grape juice mixed with a raw egg yolk every day to build up her blood. Now she is complaining of pain in her ankles when she wakes up in the morning. Could having too many eggs be causing inflammation thus the pain? I will suggest alternatives listed in your article. Thank you.